Every now and again, I get tapped to do the children’s sermon in church. For those of you who aren’t church folk, it’s pretty much exactly what you think it is: a moment in the service when a presumably sane adult (there is no actual test, mind you) takes a scripture that religiously-minded scholars have argued over for a couple of millennia and distills it down to something understandable by a savvy four-year-old. Said adult must deliver this do-it-yourself homily in less than five minutes, keep all children from three to thirteen and their parents engaged, and incorporate all precocious comments from the young ones to prevent the whole endeavor from slipping off the rails. But Kimberly, some of you may think, you don’t have kids. Why would they think of you for this job? Good question. I’ve often wondered that myself. My guess, people found out that I’ve taken improv classes and I’m fully insured. Normally, I can get out of it. I sing in the praise band, so the congregation already sees a fair amount of me. When I joined the band, I told our pastor that I wouldn’t volunteer for any other duties during worship. It’s important to me that it doesn’t turn into the Kimberly show. A variety of people should take part. This week, however, the assistant pastor was out of town, so when the minister asked me to fill in, I took pity on her. That was my first mistake. My second blunder lay in forgetting that I had agreed to do this at all. Five minutes after I said yes, all memory of the incident evaporated. The pastor had forgotten too, and sent me the scripture on which to base my offering rather late Saturday evening. Thus, with about twelve hours to prepare (minus whatever time I wanted to waste sleeping), I beheld the nightmare: the scripture was Luke 10:38-42. “Martha, Martha,” the Lord answered, “you are worried and upset about many things, but few things are needed—or indeed only one. Mary has chosen what is better, and it will not be taken away from her. 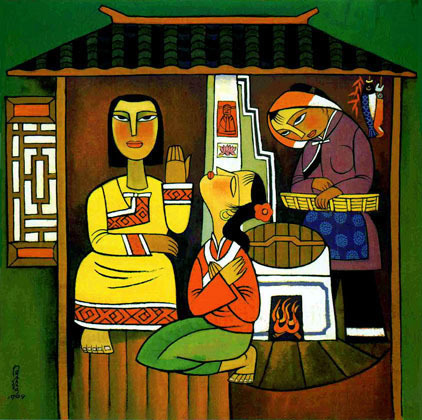 Martha and Mary, as envisioned by artist He Qi. I love the look Martha is shooting her sister. Or there’s the Kimberly translation: Jesus visits Martha and Mary. Martha kills herself to make a nice meal while Mary listens to Jesus. Martha complains. Jesus tells her to chill out. There are probably people in the world for whom this passage would be a piece of cake. I suspect each of them is a Mary. Me, I’m a Martha. Company coming? Clean the house. (Just pray they don’t open any closet doors.) Of course they’ll want to eat. I need snacks. I can’t buy them, I have to make something. Okay, maybe I can buy it, but it has to be expensive. No, I can’t sit and eat with them, I should really start cleaning up from whatever it is that they’re eating, because I don’t want my guest to have to stare at dirty dishes, even if they were just eating off the dish forty seconds ago. The story means different things to different people. In the allegorical sense, Martha is insisting that women stick to their traditional roles, and Jesus is telling her that it doesn’t have to be that way. Really, I should love this scripture, but when I read it, all I can picture is myself in Martha’s shoes, trying desperately to make a lasagna from scratch and serve it in a spotlessly clean kitchen. (Hey, Judea was a colony of the Roman Empire. She might have made lasagna. You don’t know.) Then, when I finally have a meltdown and complain about feeling deserted, instead of encouraging my sister to pick up a dish towel, this guy tells me I’ve been wasting my time. (Okay, he softens it up by saying it wasn’t the “better” thing, but still.) Somehow, I very much doubt that Martha said, “Oh, okay. I’ll sit down and listen. All right if I take notes?” No, I think there was probably some arguing, and that a large vat of water had to be made into divine cocktails before the mood took an upturn in that house. Or maybe the Prince of Peace tried his hand at turning bread into cheesecake. I’m fuzzy on the details, but I am certain that more transition time (to say nothing of a more detailed explanation) was required. Now – take all that baggage, pack it on your back and walk around with it while you present a lesson to kids, trying to pretend it isn’t there. GO! There are three ways to handle this situation. Do your research. Get some other people’s perspective to balance your own. Talk to the pastor about her interpretation of the passage. Go online and read what scholars have said. Above all, pray for clarity and inspiration. Fake it. Act like you know what you’re doing and say something you think the kids need to hear, whether or not it fits with the actual text. Pray for an earthquake during church. Call in sick. Cough a lot when you leave the message. With only a few hours’ prep time before this divine comedy would debut, there was no time for option #1. As I said, I’m a Martha, a natural martyr, so #3 was out. Fortunately, I have a lot of experience in faking my way through. In the end, I had the kids act out the situation and talk about how they’d feel. (Okay, I gave them a lot of prompting about how they should feel.) Then I asked them what would happen if everyone listened to the honored speaker and no one stepped away to make dinner. The very practical children told me it was no problem, we could just order pizza. One did note that calling for pizza wouldn’t look very hospitable to our guest. Oh, look – I found the Martha. Really, the kids’ responses may have settled the question for me. We should all take the time to soak in the love and wisdom of the Divine. That’s important. The other stuff will get done eventually. Of course, someone will still feel like it wasn’t done well enough. If I take time to breathe in the Divine, it won’t be me. Kimberly is trying to start a Marthas Anonymous group, but can’t get her house clean enough to host the meeting. It takes a true devoted “Martha” (me) to recognize another “Martha” (you). I enjoyed my cramp-in-the-gut laughter while reading your words. You know that I was unable to witness you in action that morning, however; everyone and I know that you are awesome with children and young adults. Word to the wise…, I had learned to “clean up” AFTER company, not BEFORE! Still giggling- thanks, Kim, I needed that! Came here through Erika and also giggling. Trying not to “Martha” my summer…. but, well you get the idea. I think it should be a new verb. It could also be synonymous with “My Polish Grandmothering” it. 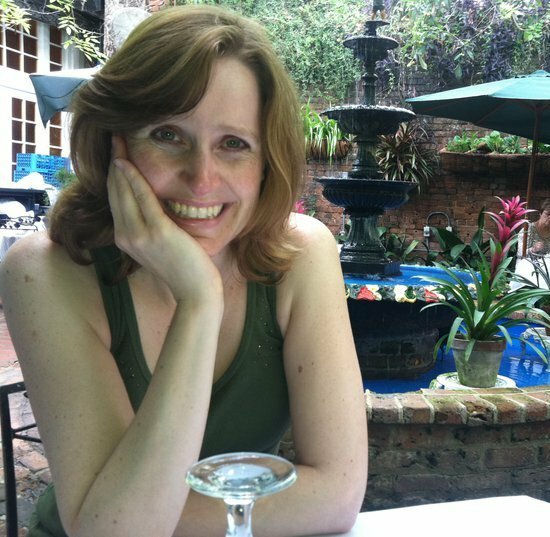 Welcome to the page, Jennifer! What a fabulous idea. “To Martha” will be my new go-to verb!